This article is about the German automobile and motorcycle manufacturer. For other uses, see BMW (disambiguation). Bayerische Motoren Werke AG pronunciation (help·info)(BMW; English: Bavarian Motor Works) is a German automobile, motorcycle and engine manufacturing company founded in 1917. BMW is headquartered in Munich, Bavaria, Germany. It also owns and produces the Minimarque, and is the parent company of Rolls-Royce Motor Cars. BMW produces motorcycles under BMW Motorrad and Husqvarna brands. In 2010, the BMW group produced 1,481,253 automobilesand 112,271 motorcycles across all its brands. BMW was established as a business entity following a restructuring of the Rapp Motorenwerke aircraftmanufacturing firm in 1917. After the end of World War I in 1918, BMW was forced to cease aircraft engine production by the terms of the Versailles Armistice Treaty.The company consequently shifted to motorcycle production in 1923, once the restrictions of the treaty started to be lifted, followed by automobiles in 1928–29. The first car which BMW successfully produced and the car which launched BMW on the road to automobile production was the Dixi, it was based on theAustin 7 and licensed from the Austin Motor Company in Birmingham, England. The circular blue and white BMW logo or roundel evolved from the circular Rapp Motorenwerke company logo, from which the BMW company grew, combined with the blue and white colors of the flag of Bavaria. The logo has been portrayed as the movement of an aircraft propeller with the white blades cutting through a blue sky — first used in a BMW advertisement in 1929, twelve years after the roundel was created — but this is not the origin of the logo itself. BMW’s first significant aircraft engine was the BMW IIIa inline-six liquid-cooled engine of 1918, much preferred for its high-altitude performance. With German rearmament in the 1930s, the company again began producing aircraft engines for the Luftwaffe. Among its successful World War II engine designs were the BMW 132 and BMW 801 air-cooled radial engines, and the pioneeringBMW 003 axial-flow turbojet, which powered the tiny, 1944-1945-era jet-powered “emergency fighter”, the Heinkel He 162 Spatz. The BMW 003 jet engine was tested in the A-1b version of the world’s first jet fighter, theMesserschmitt Me 262, but BMW engines failed on takeoff, a major setback for the jet fighter program until successful testing with Junkers engines. By the year 1959, the automotive division of BMW was in financial difficulties and a shareholders meeting was held to decide whether to go into liquidation or find a way of carrying on. It was decided to carry on and to try to cash in on the current economy car boom enjoyed so successfully by some of Germany’s ex-aircraft manufacturers such as Messerschmitt and Heinkel. The rights to manufacture the Italian Iso Isetta were bought; the tiny cars themselves were to be powered by a modified form of BMW’s own motorcycle engine. This was moderately successful and helped the company get back on its feet. The controlling majority shareholder of the BMW Aktiengesellschaft since 1959 is the Quandt family, which owns about 46% of the stock. The rest is in public float. BMW acquired the Hans Glas company based in Dingolfing, Germany, in 1966. It was reputed that the acquisition was mainly to gain access to Glas’ development of the timing belt with an overhead camshaft in automotive applications. Glas vehicles were briefly badged as BMW until the company was fully absorbed. In 1992, BMW acquired a large stake in California based industrial design studioDesignworksUSA, which they fully acquired in 1995. In 1994, BMW bought the British Rover Group (which at the time consisted of the Rover, Land Roverand MG brands as well as the rights to defunct brands including Austin andMorris), and owned it for six years. By 2000, Rover was incurring huge losses and BMW decided to sell the combine. The MG and Rover brands were sold to the Phoenix Consortium to form MG Rover, while Land Rover was taken over byFord. BMW, meanwhile, retained the rights to build the new Mini, which was launched in 2001. Chief designer Chris Bangle announced his departure from BMW in February 2009, after serving on the design team for nearly seventeen years. He was replaced by Adrian van Hooydonk, Bangle’s former right hand man. Bangle was known for his radical designs such as the 2002 7-Series and the 2002 Z4. In July 2007, the production rights for Husqvarna Motorcycles was purchased by BMW for a reported 93 million euros. BMW Motorrad plans to continue operating Husqvarna Motorcycles as a separate enterprise. All development, sales and production activities, as well as the current workforce, have remained in place at its present location at Varese. In 2006, the BMW group (including Mini and Rolls-Royce) produced 1,366,838 four-wheeled vehicles, which were manufactured in five countries. In 2010, it manufactured 1,481,253 four-wheeled vehicles and 112,271 motorcycles (under both the BMW and Husqvarna brands). The BMW X3 (E83) was made by Magna Steyr, a subsidiary of Magna of Canada, in Graz, Austria under license from BMW until 2010. More than 45,973 were produced in 2009. Starting October 2010, the new BMW X3 (F25) is produced in BMW’s plant in Spartanburg, South Carolina, U.S.A. From September 2010, the plant is producing MINI Countryman. It is reported that about 56% of BMW-brand vehicles produced are powered by petrol engines and the remaining 44% are powered by diesel engines. Of those petrol vehicles, about 27% are four-cylinder models and about nine percent are eight-cylinder models. BMW also has local assembly operation using complete knock down components in Thailand, Russia, Egypt, Indonesia, Malaysia, and India, for 3, 5, 7 series and X3. Vehicles sold in all markets according to BMW’s annual reports. Since 2008, motorcycle sales figures include Husqvarna models. 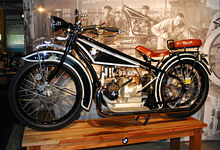 The R32 motorcycle, the first BMWmotor vehicle. BMW began building motorcycle engines and then motorcycles after World War I. Its motorcycle brand is now known as BMW Motorrad. Their first successful motorcycle, after the failed Helios and Flink, was the “R32” in 1923. This had a “boxer” twin engine, in which a cylinder projects into the air-flow from each side of the machine. Apart from their single-cylinder models (basically to the same pattern), all their motorcycles used this distinctive layout until the early 1980s. Many BMWs are still produced in this layout, which is designated the R Series. During the Second World War, BMW produced the BMW R75motorcycle with a sidecar attached. Featuring a unique design copied from the Zündapp KS750, its sidecar wheel was also motor-driven. Combined with a lockabledifferential, this made the vehicle very capable off-road, an equivalent in many ways to the Jeep. In 1982, came the K Series, shaft drive but water-cooled and with either three or four cylinders mounted in a straight line from front to back. Shortly after, BMW also started making the chain-driven Fand G series with single and parallel twin Rotax engines. In the early 1990s, BMW updated the airhead Boxer engine which became known as the oilhead. In 2002, the oilhead engine had two spark plugs per cylinder. In 2004 it added a built-in balance shaft, an increased capacity to 1,170 cc and enhanced performance to 100 hp (75 kW) for the R1200GS, compared to 85 hp (63 kW) of the previous R1150GS. More powerful variants of the oilhead engines are available in the R1100S and R1200S, producing 98 hp (73 kW) and 122 hp (91 kW), respectively. In 2004, BMW introduced the new K1200S Sports Bike which marked a departure for BMW. It features an engine producing 167 hp (125 kW), derived from the company’s work with the Williams F1 team, and is lighter than previous K models. Innovations include electronically adjustable front and rear suspension, and a Hossack-type front fork that BMW calls Duolever. BMW introduced anti-lock brakes on production motorcycles starting in the late 1980s. The generation of anti-lock brakes available on the 2006 and later BMW motorcycles pave the way for the introduction of electronic stability control, or anti-skid technology later in the 2007 model year. BMW has been an innovator in motorcycle suspension design, taking up telescopic front suspension long before most other manufacturers. Then they switched to an Earles fork, front suspension by swinging fork (1955 to 1969). Most modern BMWs are truly rear swingarm, single sided at the back (compare with the regular swinging fork usually, and wrongly, called swinging arm). Some BMWs started using yet another trademark front suspension design, the Telelever, in the early 1990s. Like the Earles fork, the Telelever significantly reduces dive under braking. In July 2007, the Italian-made Husqvarna Motorcycles was purchased by BMWfor a reported €93 million. BMW Motorrad plans to continue operating Husqvarna Motorcycles as a separate enterprise. All development, sales and production activities, as well as the current workforce, have remained in place at its present location at Varese. Husqvarna manufactures motocross, enduroand supermoto motorcycles. The New Class (German: Neue Klasse) was a line of compact sedans and coupes starting with the 1962 1500 and continuing through the last 2002s in 1977. Powered by BMW’s celebrated four-cylinder M10 engine, the New Class models featured a fully independent suspension, MacPherson struts in front, and front disc brakes. Initially a family of four-door sedans and two-door coupes, the New Class line was broadened to two-door sports sedans with the addition of the 02 Series 1600 and 2002 in 1966. Sharing little in common with the rest of the line beyond power train, the sporty siblings caught auto enthusiasts’ attention and established BMW as an international brand. Precursors to the famed BMW 3 Series, the two-doors’ success cemented the firm’s future as an upper tier performance car maker. New Class four-doors with numbers ending in “0” were replaced by the largerBMW 5 Series in 1972. The upscale 2000C and 2000CS coupes were replaced by the six-cylinder BMW E9, introduced in 1969 with the 2800CS. The 1600 two-door was discontinued in 1975, the 2002 replaced by the 320i in 1975. The 1 Series, originally launched in 2004, is BMW’s smallest car. Currently available are the second generation hatchback (F20) and first generation coupe/convertible (E82/E88). The 3 Series, acompact executive carmanufactured since model year1975, is currently in its sixth generation (F30); models include the sport sedan (F30), and fourth generation station wagon (E91), and convertible (E93) and third generation coupe (E92). The 5 Series is a mid-size executive car, available in sedan (F10) and station wagon (F11) forms. The 5 Series Gran Turismo (F07), debuted in 2010, created a segment between station wagons and crossover SUV. BMW’s full-size flagship executivesedan is the 7 Series. Typically, BMW introduces many of their innovations first in the 7 Series, such as the somewhat controversialiDrive system. The 7 Series Hydrogen, featuring one of the world’s first hydrogen fueled internal combustion engines, is fueled by liquid hydrogen and emits only clean water vapor. The latest generation (F01) debuted in 2009. Based on the 5 Series’ platform, the 6 Series is BMW’s grand touring luxury sport coupe/convertible (E63/E64). A 2-seater roadster and coupe which succeeded the Z3, the Z4 (E85) has been sold since 2002. The X3 (E83), BMW’s secondcrossover SUV (called SAV or “Sports Activity Vehicle” by BMW) debuted in 2003 and is based on the E46/16 3 Series platform. Marketed in Europe as an off-roader, it benefits from BMW’s xDrive all-wheel drive system. The all-wheel drive X5 (E70) was BMW’s first crossover SUV (SAV), based on the 5 series, and is a mid-size luxury SUV (SAV) sold by BMW since 2000. A 4-seat crossover SUV released by BMW in December 2007, the X6 is marketed as a “Sports Activity Coupe” (SAC) by BMW. The X1 extends the BMW Sports Activity Series model lineup. BMW produce a number of high-performance derivatives of their cars developed by their BMW M GmbH (previously BMW Motorsport GmbH) subsidiary. BMW has been engaged in motorsport activities since the dawn of the first BMW motorcycle in 1923. Formula BMW – A Junior racing Formula category. Kumho BMW Championship – A BMW-exclusive championship run in the United Kingdom. Dakar Rally – BMW motorcycles have won the Dakar rally six times. In 1981, 1983, 1984, 1985, 1999, and 2000. Superbike World Championship– BMW returned to premier road racing in 2009 with their all new superbike, the BMW S1000RR. BMW Sauber F1 Team Logo. BMW first entered Formula One as a full-fledged team in 2006. BMW was an engine supplier to Williams, Benetton, Brabham, and Arrows. Notable drivers who have started their Formula One careers with BMW includeJenson Button, Juan Pablo Montoya, Robert Kubica and Sebastian Vettel. In July 2009, BMW announced that it would withdraw from Formula One at the end of the 2009 season. The team was sold back to the previous owner, Peter Sauber, who kept the BMW part of the name for the 2010 season due to issues with the Concorde Agreement. The team has since dropped BMW from their name starting in 2011. Le Mans 24 Hours – BMW won Le Mans in 1999 with the BMW V12 LMRdesigned by Williams Grand Prix Engineering. Also the Kokusai Kaihatsu Racing team won the 1995 edition with a BMW-engined McLaren F1 GTRrace car. Nürburgring – BMW won the 24 Hours Nürburgring 18 times and the 1000km Nürburgring twice (1976 and 1981). McLaren F1 GTR – Successful mid-1990s GT racing car with a BMW designed engine. It won the BPR Global GT Series in 1995 and 1996 and the 24 Hours of Le Mans in 1995. American Le Mans Series – BMW has won three (2001, 2010, 2011) GT Team Championships and GT Automobile Manufacturer titles. Twice (2010, 2011) with Team RLL in the Crowne Plaza V8 powered M3 coupe and once (2001) with the BMW Motorsport team in the V8 powered M3 GTR. BMW has a long and successful history in touring car racing. European Touring Car Championship (ETCC) – Since 1968, BMW won 24 drivers’ championships along with several manufacturers’ and teams’ titles. World Touring Car Championship (WTCC) – BMW won four drivers’ championship (1987, 2005, 2006 and 2007) and three manufacturers’ titles (2005–2007). British Touring Car Championship (BTCC) – BMW won the drivers’ championship in 1988, 1991, 1992 and 1993 and manufacturers’ championship in 1991 and 1993. SCCA Pro Racing World Challenge Touring Car Series(WC) – BMW won the manufacturer’s championship in 2001 and Bill Auberlen, driving a Turner Motorsport BMW 325i, won the 2003 and 2004 Driver’s Championships. Japanese Touring Car Championship (JTCC) – BMW (Schnitzer) flew from Europe to Japan to compete in the JTCC and won the championship in 1995. Mille Miglia – BMW won the 1940 Brescia Grand Prix with a 328 Touring Coupé. Previously in 1938 the 328 sport car won the Mille Miglia 2000 litre class. RAC Rally – The 328 sport car won this event in 1939. Paris Dakar Rally – BMW motorcycles have won this event 6 times total including 1981, 1983, 1984, 1985, 1999, 2000. Tour de Corse – The BMW M3 – E30 won this event in 1987. BMW sponsors many other sports beyond motorsport. It is an official sponsor of the London 2012 olympics providing 4000 BMWs and Minis in a deal made in November 2009. The company also made a six-year sponsorship deal with the United States Olympic Committee (USOC) in July 2010. BMW has sponsored various European golf events such as the PGA Championship at Wentworth, the BMW Italian Open and the BMW International Open in Germany. The company is a charter member of the U.S. Environmental Protection Agency’s (EPA) National Environmental Achievement Track, which recognises companies for their environmental stewardship and performance. It is also a member of the South Carolina Environmental Excellence Program and is on theDow Jones Sustainability Group Index, which rates environmentally friendly companies. BMW has taken measures to reduce the impact the company has on the environment. It is trying to design less-polluting cars by making existing models more efficient, as well as developing environmentally friendly fuels for future vehicles. Possibilities include: electric power, hybrid power (combustion engines and electric motors) hydrogen engines. BMW offers 49 models with EU5/6 emissions norm and nearly 20 models with CO2 output less than 140 g/km, which puts it on the lowest tax group and therefore could provide the future owner with eco-bonus offered from some European countries. However, there have been some criticisms directed at BMW, and in particular, accusations of greenwash in reference to their BMW Hydrogen 7. Some critics claim that the emissions produced during hydrogen fuel production outweigh the reduction of tailpipe emissions, and that the Hydrogen 7 is a distraction from more immediate, practical solutions for car pollution. BMW has created a range of high-end bicycles sold online and through dealerships. They range from the Kid’s Bike to the EUR 4,499 Enduro Bike.In the United States, only the Cruise Bike and Kid’s Bike models are sold. BMW vehicles follow a certain nomenclature; usually a 3 digit number is followed by 1 or 2 letters. The first number represents the series number. The next two numbers traditionally represent the engine displacement in cubic centimeters divided by 100. However, more recent cars use those two numbers as a performance index, as e.g. the 116i, 118i and 120i (all 2,0L gas-powered), just like the 325d and 330d (both 3,0L diesel) share the same motor block while adjusting engine power through setup and turbocharging. A similar nomenclature is used by BMW Motorrad for their motorcycles. †† typically includes sport seats, spoiler, aerodynamic body kit, upgraded wheels and Limit Slip Differential on pre-95 model etc. For example, the BMW 750iL is a fuel-injected 7 Series with a long wheelbase and 5.4 litres of displacement. This badge was used for successive generations, E65 and F01, except the “i” and “L” switched places, so it read “Li” instead of “iL”. When ‘L’ supersedes the series number (e.g. L6, L7, etc.) it identifies the vehicle as a special luxury variant, featuring extended leather and special interior appointments. The L7 is based on the E23 and E38, and the L6 is based on the E24. When ‘X’ is capitalised and supersedes the series number (e.g. X3, X5, etc.) it identifies the vehicle as one of BMW’s Sports Activity Vehicles (SAV), their brand of crossovers, featuring BMW’s xDrive. The second number in the ‘X’ series denotes the platform that it is based upon, for instance the X5 is derived from the 5 Series. Unlike BMW cars, the SAV’s main badge does not denote engine size; the engine is instead indicated on side badges. The ‘Z’ identifies the vehicle as a two-seat roadster (e.g. Z1, Z3, Z4, etc.). ‘M’ variants of ‘Z’ models have the ‘M’ as a suffix or prefix, depending on country of sale (e.g. ‘Z4 M’ is ‘M Roadster’ in Canada). Previous X & Z vehicles had ‘i’ or ‘si’ following the engine displacement number (denoted in litres). BMW is now globally standardising this nomenclature on X & Z vehicles by using ‘sDrive’ or ‘xDrive’ (simply meaning rear or all-wheel drive, respectively) followed by two numbers which vaguely represent the vehicle’s engine (e.g. Z4 sDrive35i is a rear-wheel-drive Z4 roadster with a 3.0 L twin-turbo fuel-injected engine). BMW last used the ‘s’ for the E36 328is, which ceased production in 1999. However, the ‘s’ nomenclature was brought back on the 2011 model year BMW 335is and BMW Z4 sDrive35is. The 335is is a sport-tuned trim with more performance and an optional dual clutch transmission that slots between the regular 335i and top-of-the-line M3. The ‘M’ – for Motorsport – identifies the vehicle as a high-performance model of a particular series (e.g. M3, M5, M6, etc.). For example, the M6 is the highest performing vehicle in the 6 Series lineup. Although ‘M’ cars should be separated into their respective series platforms, it is very common to see ‘M’ cars grouped together as its own lineup on the official BMW website. There are exceptions to the numbering nomenclature. The M version of the BMW 1 Series was named the BMW 1 Series M Couperather than the traditional style “M1” due to the possible confusion with BMW’s former BMW M1 homologation sports car. The M versions of the Sports Activity Vehicles, such as the X5 M, could not follow the regular naming convention since MX5 was used for Mazda’s MX-5 Miata. For instance in the 2008 model year, the BMW 125i/128i, 328i, and 528i all had 3.0 naturally aspirated engines (N52), not a 2,500 cc or 2,800 cc engine as the series designation number would lead one to believe. The ’28’ is to denote a detuned engine in the 2008 cars, compared to the 2006 model year ’30’ vehicles (330i and 530i) whose 3.0 naturally aspirated engines are from the same N52 family but had more output. The 2008 BMW 335i and 535i also have 3.0-litre engine; however the engines are twin-turbocharged (N54) which is not identified by the nomenclature. Nonetheless the ’35’ indicates a more powerful engine than previous ’30’ models that have the naturally aspirated N52 engine. The 2011 BMW 740i and 335is shares the same twin-turbo 3.0 engine from the N54 family but tuned to higher outputs, although the badging is not consistent (’40’ and ‘s’). The 2013 BMW 640i Gran Coupe’s twin-scroll single turbo 3.0L inline-6 engine makes similar output to the older twin turbo inline-6 engines. The E36 and E46 323i and E39 523i had 2.5-litre engines. The E36 318i made after 1996 has a 1.9 L engine (M44) as opposed to the 1.8 L (M42) used in the 1992 to 1995 models. The E39 540i had a 4.4 L M62 engine, instead of a 4.0 L as the designation would suggest. The badging for recent V8 engines (N62 and N63) also does not indicate displacement, as the 2006 750i and 2009 750i have 4800 cc (naturally aspirated) and 4400 cc (twin-turbocharged) engines, respectively. From the summer of 2001 until October 2005, BMW hosted the”BMW Films”. Archived from [/ the original] on 27 September 2007. website, showcasing sporty models being driven to extremes. These videos are still popular within the enthusiast community and proved to be a ground-breaking online advertising campaign. Annually since 1999, BMW enthusiasts have met in Santa Barbara, CA to attend Bimmerfest. One of the largest brand-specific gatherings in the U.S., over 3,000 people attended in 2006, and over 1,000 BMW cars were present. In 2007, the event was held on 5 May. The initials BMW are pronounced [ˈbeː ˈɛm ˈveː] in German. The model series are referred to as “Einser” (“One-er” for 1 series), “Dreier” (“Three-er” for 3 series), “Fünfer” (“Five-er” for the 5 series), “Sechser” (“Six-er” for the 6 series), “Siebener” (“Seven-er” for the 7 series). These are not actually slang, but are the normal way that such letters and numbers are pronounced in German. The English slang terms Beemer, Bimmer and Bee-em are variously used for BMWs of all kinds, cars and motorcycles. In the US, specialists have been at pains to prescribe that a distinction must be made between using Beemer exclusively to describe BMW motorcycles, and using Bimmer only to refer to BMW cars, in the manner of a “true aficionado” and avoid appearing to be “uninitiated.” The CanadianGlobe and Mail prefers Bimmer and calls Beemer a “yuppie abomination,”while the Tacoma News Tribune says it is a distinction made by “auto snobs.” Using the wrong slang risks offending BMW enthusiasts.An editor of Business Week was satisfied in 2003 that the question was resolved in favor of Bimmer by noting that a Google search yielded 10 times as many hits compared to Beemer. 1975 BMW 3.0CSL painted by Alexander Calder. Manufacturers employ designersfor their cars, but BMW has made efforts to gain recognition for exceptional contributions to and support of the arts, including art beyond motor vehicle design. These efforts typically overlap or complement BMW’s marketing and branding campaigns. Theheadquarters building, designed in 1972 by Karl Schwanzer has become a European icon, and artist Gerhard Richter created his Red, Yellow, Blue series of paintings for the building’s lobby. In 1975, Alexander Calder was commissioned to paint the 3.0CSL driven by Hervé Poulain at the 24 Hours of Le Mans. This led to more BMW Art Cars, painted by artists including David Hockney, Jenny Holzer,Roy Lichtenstein, and others. The cars, currently numbering 17, have been shown at the Louvre, Guggenheim Museum Bilbao, and, in 2009, at the Los Angeles County Museum of Art and New York’s Grand Central Terminal.BMW was the principal sponsor of the 1998 The Art of the Motorcycleexhibition at the Solomon R. Guggenheim Museum and other Guggenheim museums, though the financial relationship between BMW and the Guggenheim was criticised in many quarters. The 2006 “BMW Performance Series” was a marketing event geared to attract black car buyers, and featured the “BMW Pop-Jazz Live Series,” a tour headlined by jazz musician Mike Phillips, and the “BMW Blackfilms.com Film Series” highlighting black filmmakers. BMW has garnered a reputation over the years for its April Fools pranks, which are printed in the British press every year. In 2010, they ran an advert announcing that customers would be able to order BMWs with different coloured badges to show their affiliation with the political party they supported. BMWs have been assembled in South Africa since 1968, when Praetor Monteerders’ plant was opened in Rosslyn, near Pretoria. BMW initially bought shares in the company, before fully acquiring it in 1975; in so doing, the company became BMW South Africa, the first wholly owned subsidiary of BMW to be established outside Germany. Three unique models that BMW Motorsport created for the South African market were the E23 M745i (1983), which used the M88 engine from the BMW M1, the BMW 333i (1986), which added a six-cylinder 3.2-litre M30 engine to the E30, and the E30 BMW 325is (1989) which was powered by an Alpina-derived 2.7-litre engine. Unlike U.S. manufacturers, such as Ford and GM, which divested from the country in the 1980s, BMW retained full ownership of its operations in South Africa. Following the end of apartheid in 1994, and the lowering of import tariffs, BMW South Africa ended local production of the 5-Series and 7-Series, in order to concentrate on production of the 3-Series for the export market. South African–built BMWs are now exported to right hand drive markets including Japan, Australia, New Zealand, the United Kingdom, Indonesia, Malaysia, Singapore, and Hong Kong, as well as Sub-Saharan Africa. Since 1997, BMW South Africa has produced vehicles in left-hand drive for export to Taiwan, the United States and Iran, as well as South America. BMWs with a VIN starting with “NC0” are manufactured in South Africa. BMW Manufacturing Co has been manufacturing the X5 and, more recently, the X6 in Greer nearSpartanburg, South Carolina, USA. The smaller X3 has began production in Spartanburg. BMW’s with a VIN starting with “4US and 5US” are manufactured in Spartanburg. 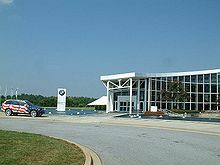 In 2010 BMW announced that it would spend $750 million to expand operations at the Spartanburg plant. This expansion will allow production of 240,000 vehicles a year and will make the plant the largest car factory in the United States by number of employees. BMW India was established in 2006 as a sales subsidiary inGurgaon (National Capital Region). A state-of-the-art assembly plant for BMW 3 and 5 Series started operation in early 2007 in Chennai. Construction of the plant started in January 2006 with an initial investment of more than one billion Indian Rupees. The plant started operation in the first quarter of 2007 and produces the different variants of BMW 3 Series and BMW 5 Series. In 2011, The Brand Trust Report, India study, ranked BMW as the 33rd most trusted brand in India. Signing a deal in 2003 for the production of sedans in China, May 2004 saw the opening of a factory in the North-eastern city of Shenyang where Brilliance Automotive produces BMW-branded automobiles in a joint venture with the German company. Yanase Co., Ltd. is the exclusive retailer of all imported BMW (passenger cars and motorcycles) products to Japanese consumers, and has had the exclusive rights to do so since the end of World War II. In October 2008, BMW Group Canada was named one of Greater Toronto’s Top Employers by Mediacorp Canada Inc., which was announced by theToronto Star newspaper. Bavarian Auto Group is a multinational group of companies established in March 2003 when it was appointed as the sole importer of BMW and Mini in Egypt, with monopoly rights for import, assembly, distribution, sales and after-sales support of BMW products in Egypt. Since that date, BAG invested a total amount of US$100 million distributed on seven companies and 11 premises in addition to three stores. Currently, the facility enables Bavarian Auto the opportunity to offer a full range of locally assembled models; including the BMW 3 Series, 5 Series, 7 Series and X3 which. In combination with a new range of imported models; including the BMW 1 Series, 6 Series, X5, X6 and various Mini models. In 2012 BMW vehicles were stolen by programming a blank key fob to start the car through the on-board diagnostics (OBD) connection. The primary causes of this vulnerability lie in the lack of appropriate authentication andauthorization in the OBD specifications, which rely largely on security through obscurity. ^ “When was BMW founded?”. BMW Education. BMW. Retrieved 30 September 2012. ^ “Fliegerschule St.Gallen – history” (in German). Archived from the original on 28 May 2007. Retrieved 24 August 2008. ^ BMW. “The origin of the BMW logo”. Retrieved 29 December 2011. ^ Stephen Williams. “BMW Roundel: Not Born From Planes”. Retrieved 29 December 2011. ^ “BMW Model IIIA – Smithsonian National Air and Space Museum”. Nasm.si.edu. Archived from the original on 8 April 2010. Retrieved 18 April 2010. ^ “Chris Bangle”. Retrieved 24 May 2012. ^ Smith, Jacquelyn. “The World’s Most Reputable Companies”. Forbes.com. Retrieved 7 June 2012. ^ a b “BMW Group”. BMW Group. Archived from the original on 30 April 2011. Retrieved 1 June 2011. ^ “World Motor Vehicle Production, OICA correspondents survey 2006” (PDF). Retrieved 28 August 2010. ^ Hilton Holloway (11 February 2011). “The future of BMW’s engines”. Autocar. ^ Peter Gantriis, Henry Von Wartenberg. “The Art of BMW: 85 Years of Motorcycling Excellence”. MotorBooks International, Sep. 2008, p. 10. ^ “BMW 5-Series Gran Turismo”. reported by newBMWseries.com. Retrieved 22 October 2009. ^ “BMW to quit F1 at end of season”. BBC News. 29 July 2009. Archived from the original on 29 July 2009. Retrieved 29 July 2009. ^ “BMW chosen to provide official Minis for 2012 London Olympics”. The Times. 18 November 2009. Retrieved 28 July 2011. ^ “BMW extends sponsorship of Wentworth PGA event”. Sportbusiness.com. Retrieved 28 July 2011. ^ “Not as Green at it Seems”. ^ “BMW Online Shop”. Shop.bmwgroup.com. 21 March 2009. Retrieved 11 April 2009. ^ Cunningham, Wayne (13 July 2010). “2011 BMW 335is (photos) – CNET Reviews”. Reviews.cnet.com. Archived from the original on 27 August 2010. Retrieved 28 August 2010. ^ “Bee em / BMW Motorcycle Club of Victoria Inc”. National Library of Australia. Retrieved 23 October 2009. ^ “Bimmer vs. Beemer”. boston-bmwcca.org. Archived from the original on 1 July 2007. Retrieved 23 June 2007. ^ “GWINNETT VENT. (Gwinnett News)”. The Atlanta Journal-Constitution (Atlanta, GA): p. J2. 11 February 2006. “It is Bimmers people, Bimmers. Not Beamers, not Beemers. Just Bimmers. And start pronouncing it correctly also. No, it’s BMWs, not Bimmers. ^ “Corporate Information: History”. BMW South Africa. ^ “BMW South Africa – Plant Rosslyn”. Bmwplant.co.za. Retrieved 11 April 2009. ^ “Out with the old, in with the new” (Press release). BMW AG. 16 October 2006. Retrieved 4 September 2008. ^ Bennett, Jeff (14 October 2010). “BMW to Expand Plant in South Carolina”. The Wall Street Journal: p. B5. ^ Interone Worldwide GmbH (11 December 2006). “International BMW website”. Bmw.in. Archived from the original on 17 April 2009. Retrieved 11 April 2009. ^ “Maruti emerges seventh on list of nation’s most trusted 300 brands”. indiaprwire.com. 2011-24-20. ^ “BMW opens China factory – TestDriven.co.uk”. Testdriven.co.uk. 21 May 2004. Archived from the original on 21 March 2009. Retrieved 11 April 2009. ^ “Reasons for Selection, 2009 Greater Toronto’s Top Employers Competition”. ^ Titcomb, James (6 July 2012). “Alarming moment thieves silently steal BMW by programming a blank key that cost just £70 in new crime trend sweeping Britain”. Daily Mail. Retrieved 23 August 2012. ^ “Pistonheads report into thefts via obd”. Retrieved 2 July 2012. ^ Torchinsky, Jason (6 July 2012). “Watch Hackers Steal A BMW In Three Minutes”. Jalopnik. Retrieved 28 August 2012. ^ Van den Brink, Rob (PDF). Dude, Your Car is Pwnd. SANS Institute.